Comtrend’s new series features TR-069 remote management for seamless integration into Service Provider’s existing systems. 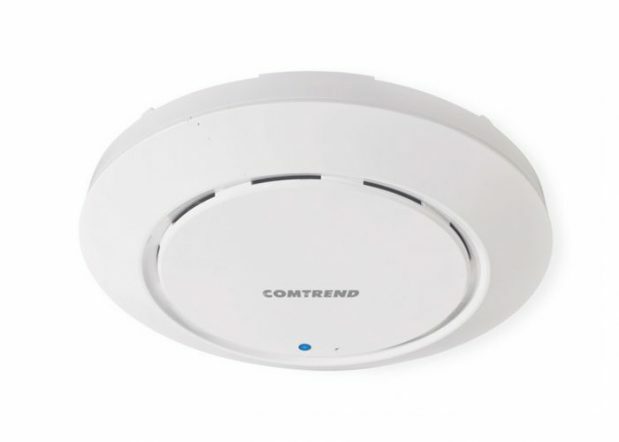 Comtrend, a leader in advanced networking solutions, announced today its new WAP-EN series of 11AC business-grade Access Points with TR-069 support. This new series boasts comprehensive networking features for small to mid-size business applications (SMBs), while also being an affordable way to improve Internet connectivity in large homes. With TR-069 support, the WAP-EN series is ideal for Services Providers who will be able to reduce truck rolls with remote management to easily fix wireless issues. Comtrend’s new series features high powered (400mW to 560mW), high sensitivity (-93dBm to -95dBm) 11AC wireless connectivity. The combination of high power and high receiver sensitivity result in flawless wireless coverage whether for business locations or homes. With high-performance 3×3 MIMO AC1750 (1,300Mbps on the 5GHz band, and 450Mbps on the 2.4GHz band), the WAP-EN series is the ideal solution for the demanding day-to-day operations of schools, hotels, and hospitals. The WAP-EN series also includes a gigabit 802.3af Power over Ethernet PSE port for simplified installation. The series comes in both ceiling and wall mount options with mounts included for easy installations. Guest Network: Easily setup Guest Networks to isolate the local network from the wireless clients via an IP filter. Cluster Configuration: Using cluster configuration customers can dedicate one access point as the controller and manage up to five other access points. Smart Handover: With smart handover technology, SMB locations can also manage the handoff of client devices from one access point to another with negligible interruption. The WAP-EN1200C and WAP-EN1750W are currently available for samples. Please contact your sales representative or email NA(dot)Sales(at)Comtrend(dot)com for more information.